Young Optics as a competitive integrated design manufacturer of optics, is endeavoring to a further variety of optical modules and components by enhancing profession in optical design, precise mechanical design, electronic design, software design, and optical components manufacturing , including glass lens, molding glass, ASP Injection, precise optical coating (AR/IR/UVIR), upper precise grind/polishing , precise burnish, precise machinery, precise measurement and assembly . 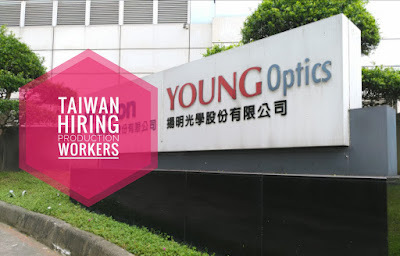 Location: No.7, Hsin-Ann Rd., Hsinchu Science Park, Hsinchu, Taiwan 30076, R.O.C. Im from cagayan de oro city. how can i apply? My papers n po aq jan..pwd po paline up..
No experience,short course only,pero ready po mgwork at mabilis matuto..
im from mindanao is there any branch office of yours here?